"Who doesn't love fringe?" Heidi Klum asked her fellow judges on a recent episode of Project Runway. I thought about it for a minute, and realized that she's right. There's something about fringe that gives any look a "wow factor." Maybe it's because fringe has such amazing movement - you literally swing from place to place. 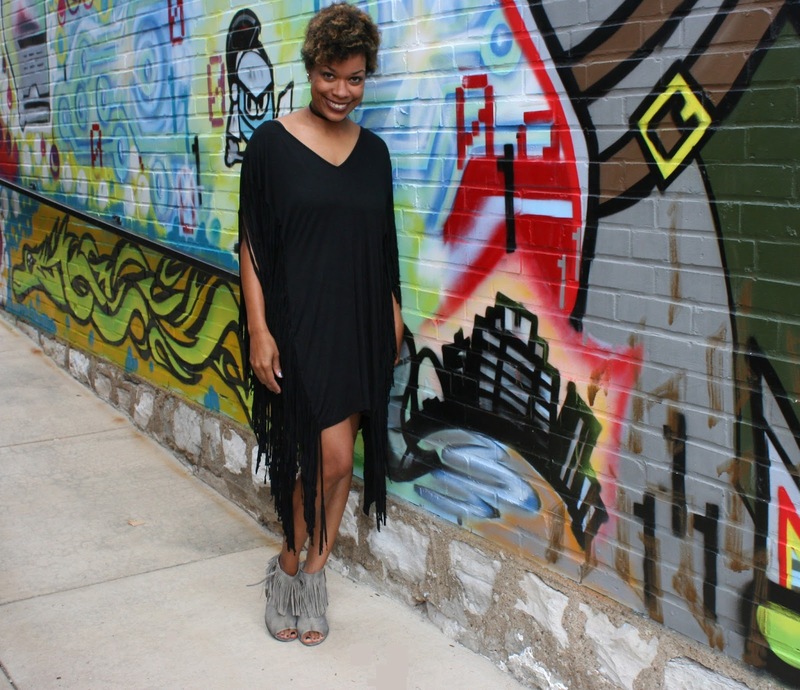 Perhaps it is fringe's ability to look boho, edgy, or both depending on the outfit. Regardless, fringe is fun. So, when the team at Tobi reached out and invited me to select something from their catalog, a black fringe dress stood out. I don't typically shop online. I love the experience of actually visiting a store and seeing what catches my fancy too much. I also get nervous that whatever I order online won't fit, and despite free returns at many places, I just don't want to deal with the hassle. But, in the spirit of trying something new, I checked out the Tobi site. I have friends that avoid thrift stores because the sheer volume of garments make them feel overwhelmed, which is understandable for the novice thrifter. That's a bit like I felt when I first visited the Tobi web site. I sifted through page after page after page of dresses, tops, pants, and skirts. There was so much cute stuff that I wasn't sure what I wanted to order! Being a West Coast company, many of the clothes had that relaxed, backless-but-not-wearable-with-a-normal-bra look. That unfortunately eliminated a large chunk of the dresses for me (I mean, I have had 2 kids. . . ;). Then I saw a dress that caused me to make an exception. The deep V fringe dress looked so cool that I knew I wanted it. With a black tank underneath for extra coverage, it still maintained its rock-star edge. To complete the look, I used my trusty matchy-matchy trick: fringe booties. 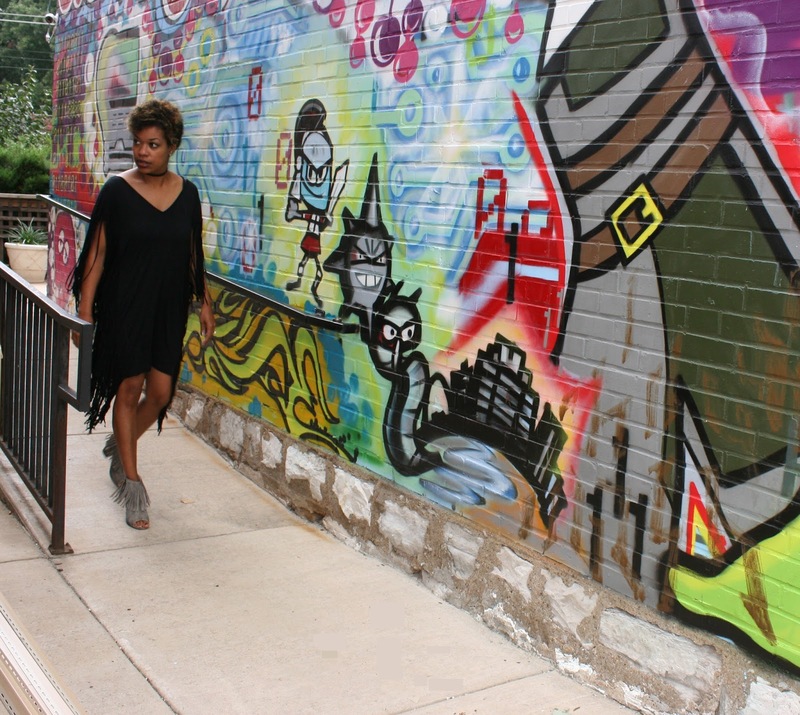 As Flora (and a couple of construction workers) looked on, I swung into photoshoot action in front of a graffiti wall. What do you think - do you love fringe, too? P. S. S. Thanks, Tobi for the awesome dress! All opinions, as always, are my own.